New Delhi, Aug. 8: As the Center attempts to defuse tension in north Bengal and Assam, Gorkha and Bodo groups seem to be inching towards an understanding for joint action. Distrust has grown between the Centre and ethnic groups after the announcement on Telangana. Now moderate and radical groups demanding Gorkhaland and Bodoland are ready to find a meeting ground to synergise their protests. The groups, including ruling outfits like the Gorkha Janmukti Morcha (GJM) in Darjeeling hills and the Bodoland People’s Front in Assam, are facing mounting pressure from within the ranks to act. As a result, they feel the need to act jointly. Last week, GJM general secretary Roshan Giri and BPF Rajya Sabha MP Biswajit Daimary spoke on forging an understanding that would help both. “We have an understanding that can mutually benefit our causes,” Daimary said wihtout elaborating on the contours of a detailed strategy. The Centre has tackled the groups with separate tactics. 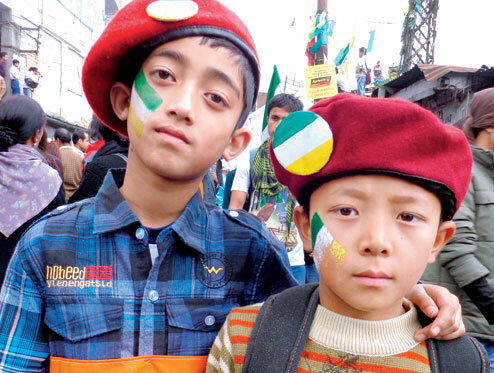 While it has adopted a two-pronged strategy with the BPF, with both Delhi and Dispur engaging in talks with its leaders, it has cold-shouldered the GJM, which is also facing a combative Trinamul Congress government, led by Mamata Banerjee, in Bengal. Giri has been camping here seeking a meeting with Congress president Sonia Gandhi. Prime Minister Manmohan Singh and Assam chief minister Tarun Gogoi met leaders of the BPF, and ally at Dispur, yesterday. An announcement for a tripartite meeting with Bodo students could be announced by August 13, sources said. The future course of action by outfits whose stakes have suddenly come into sharp focus after the Telangana announcement, therefore, continues to be uncertain. Govinda Basumatary, the general secretary of the National Democratic Front of Boroland (Progressive) said, “We are in talks with like-minded groups in Gorkhaland so that we can help each other and express solidarity.” He added that overground groups were also meeting so that they can take advantage in the elections. Sources in the GJM also said they were in talks with the BPF for cooperation. Meeting of Gorkha and Bodo protesters can spell trouble for security planners who are forever worried about security in chicken’s neck, a sliver of land that connects the Northeast with the rest of India. In the home ministry, the mood is sombre after the announcement of Telangana as new concerns about security have cropped up, especially in the Bodo belt and Karbi Anglong district in Assam.